Line a baking sheet with parchment paper and evenly spread out green beans and tomatoes on baking sheet. Drizzle with 1-2 Tablespoons of olive oil and toss to coat vegetables. Sprinkle with salt and pepper. Place in preheated oven and roast for 15 to 20 minutes, until tomatoes begin to split open. While the vegetables are roasting and farro is cooking, start the onion and mushroom caramelization. Place a cast iron skillet (or any heavy bottom skillet) over medium-high heat and add 1 tablespoon olive oil and butter. Once the butter is melted, add sliced onions and mushrooms and toss to coat. Let cook, untouched for 5 to 7 minutes. Toss. Let cook for another 5 to 7 minutes, untouched. At this point, add a pinch of salt and toss. Remove skillet from heat, add balsamic vinegar, and toss to coat. Return skillet to heat and continue to cook, tossing occasionally, until onions are browned and broken down (another 10 to 15 minutes). 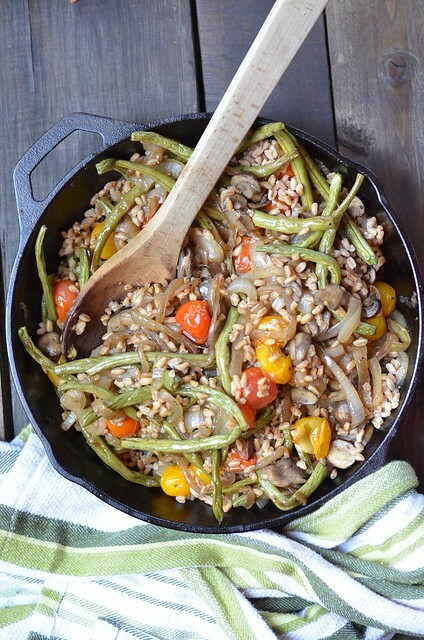 In a large serving bowl, toss together the roasted green beans, tomatoes, caramelized onions and mushrooms, and farro. Serve warm.